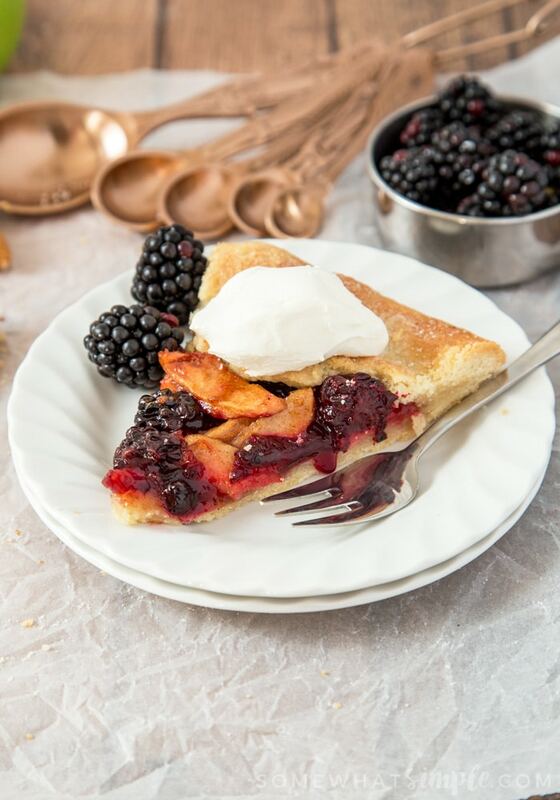 Juicy blackberries and tender apples are encased in a rich, buttery pastry to create this truly amazing Blackberry and Apple Galette. So good you won’t want to share! This may be only the third time I’ve made a galette in my life, but every time I make one I ask myself why I don’t do it more often. They are SO easy and free form, so if they’re a little “rustic” looking, then that’s fantastic! I decided to mix blackberries with crisp granny smith apples for this version and, oh my goodness, it turned out perfectly! 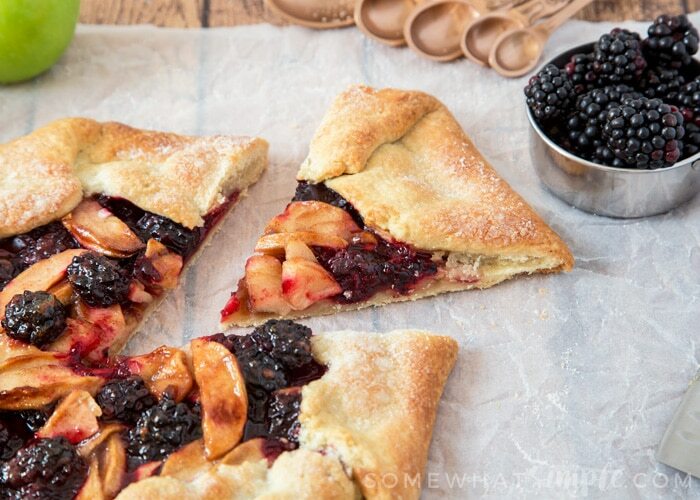 I developed my absolutely fail safe, go to shortcrust pastry dough a couple of years back and I knew I just had to use it for this Blackberry and Apple Galette. I’ve probably made it 50 times and it turns out perfectly every single time. 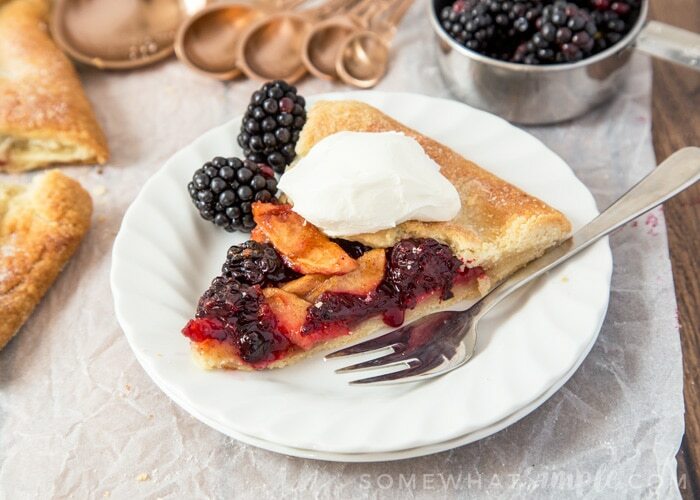 It was the perfect crust to marry together with apples, cinnamon and juicy blackberries. The entire galette disappeared in under 36 hours in my house. That is some praise from my fiancé who “doesn’t really like dessert”! 1 and ½ sticks (170g) cold unsalted butter, cut into 1 inch cubes. Make the pastry first: Place flour, sugar, salt and butter into your food processor and pulse until you have a coarse breadcrumb texture and there are no huge lumps of butter. Add the water, 1tbsp at a time and pulse until the mixture comes away from the sides and forms a ball. Alternatively you can place the ingredients into a large bowl, cut the butter into the flour with a pastry cutter and then add the water, mixing with your hands until a dough forms. Tip the dough onto a piece of cling film and shape into a disc. Place in the fridge for at least 30 minutes to firm up. Whilst the pastry is chilling, preheat the oven to 400F/200C and line a baking tray with grease proof paper/a Silpat/silicone mat. Make the filling: Place sliced apples, cornstarch, cinnamon, sugar, vanilla extract and water into a medium sized saucepan over a low-medium heat. Remove from the heat and add in the blackberries, stir gently to coat them in the cinnamon sugar mixture being careful not to squish all the blackberries into pulp! Leave to one side. Transfer the pastry to your lined baking tray. I roll it loosely around the rolling pin, then unroll it onto the tray. Spoon the blackberry and apple mixture into the centre of the pastry and then spread out the mixture into a 9inch circle, leaving 2-3 inches around the edge. Next, fold the outer edges of the galette over the edge of the filling. I made each of my folds around 2 inches long and you need to overlap one edge of the fold you have in your hand onto the previous fold. Repeat until you have encased the filling entirely. I had about 8 folds in the end. You want to be able to see most of the filling, so don’t stretch the pastry right over the top. Brush the edges of the galette with water and sprinkle with granulated sugar. Place in the oven for 27-32 minutes, until the edges are golden and the fruit in the centre is bubbling. You can egg wash the crust if you prefer a darker crust. I like a lighter golden crust, so brush it with water to make the sugar stick! Leave to cool on the tray completely, before slicing into 8-10 pieces and devouring! Galettes always look so pretty! This combination sounds so good! Thanks for linking up with our Merry Monday party. 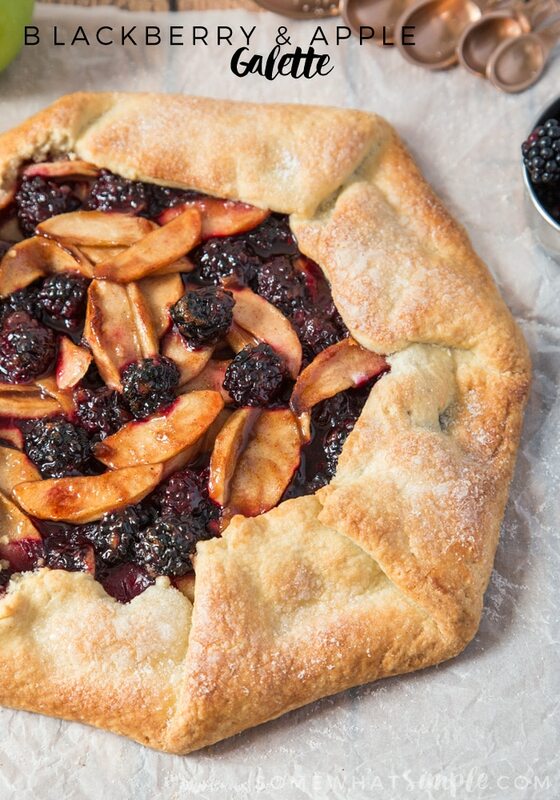 We will just love your combination of Blackberry and Apple’s for your delicious Galette. Hope you have a great weekend and thanks so much for sharing with Full Plate Thursday. how do you get such great pictures? I have a Nikon and they never come out like that.